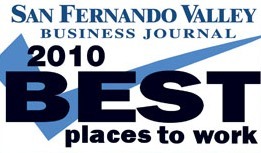 We’re so happy to announce that we’ve made San Fernando Valley’s ‘Best Places to Work’ for the third year in a row. Cydcor was specifically recognized for a supportive work environment and culture, volunteer opportunities, quality and commitment of management, and benefits. The Business Journal and Best Companies Group worked together to identify and recognize area companies with a strong commitment to workplace excellence. Both publicly and privately held organizations were selected based on benefits, corporate philanthropy, policies, work-life balance, internal working conditions, local management, satisfaction, camaraderie and support of employees’ personal growth. Selections were based on company surveys and employee comments.